Transforming Saṃsāra and Nirvāṇa into the Pure Land of Samantabhadra. As you recite, within that state, sustain the essence of intrinsic awareness. Then, engage in your usual daily activities. At the request of the Vidyadhāra Dhévi, this dawned upon Śrī from within the expanse of intrinsic awareness; and as it did, immediately thereupon he set it down in writing. Translated from the Tibetan by Erick Tsiknopoulos, March 31st 2017, in McLeod Ganj, India, at the request of Khenchen Lama Rinpoché. By the positive karmic potential of this translation, may great signs of virtue pervade the ten directions. 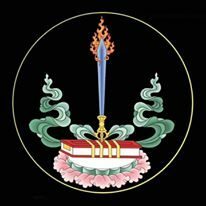 1 Khenchen Lama Rinpoché says that the color, in addition to bright white, can also be bright red or bright green, as in the pictures below.